In the last posting It’s Alive! I mentioned that we got our entry permit and pre approval of the building drawings so we went about finding someone to clear the lot of the trees while we waited for the drawings to be finalized. I had to wait a few weeks for our heating drawings to be completed and the trees were cleared just last week. Cutting down trees in Trent Hills does not require a permit so we hired a local tree removal contractor to clear the lot. The family and I went to the lot last week to see what it looked like after the trees were cleared and the result was fantastic! We brought some camping chairs and a couple of beers and sat by the water for the day. I went for a swim in the lake and just looked around imagining what it will be like coming here every summer. The second purpose for going to the lot was to meet with the Chief Building Officer and get the building permits allowing for construction to begin. From what I’ve heard from other people it often takes 2-3 weeks before the permits are issued so I wasn’t sure what to expect from the meeting. As it turned out the Building Officer was very friendly and helpful. We had a couple of changes that needed to be made to the drawings, but the Officer gave us the permits and I was on my way. I had a quick meeting with the septic contractor and he is going to start this week. So everything is looking up. I’ve got to make sure I stay on top of the budget and do my best to keep the contractors on schedule so that I have a weather tight building before the winter comes. 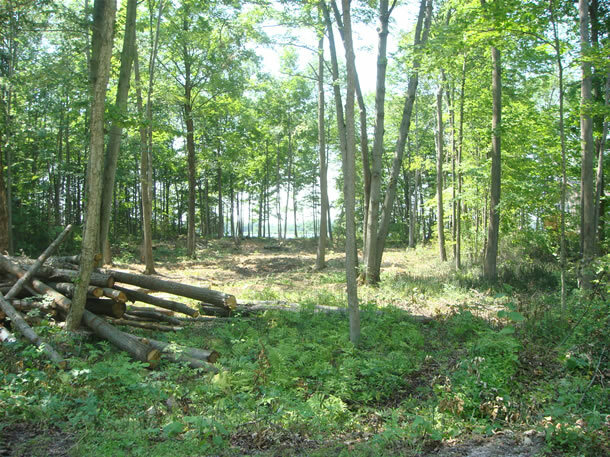 Here’s a picture of my lot now that a number of the trees have been cleared.